Fractions, The Whole Process on ONE Page! Many years ago, when my eldest son was learning fractions, he came home one night and asked for some help. I thought it would be an easy task to simply explain the part of the process he was having trouble with by showing him that spot in the textbook. NO SIMPLE TASK! It took me quite a while to figure out where to look. The index didn't help. Trying to flip pages didn't help much either. It was sort of like looking up a word in the dictionary when you don't know how to spell it. 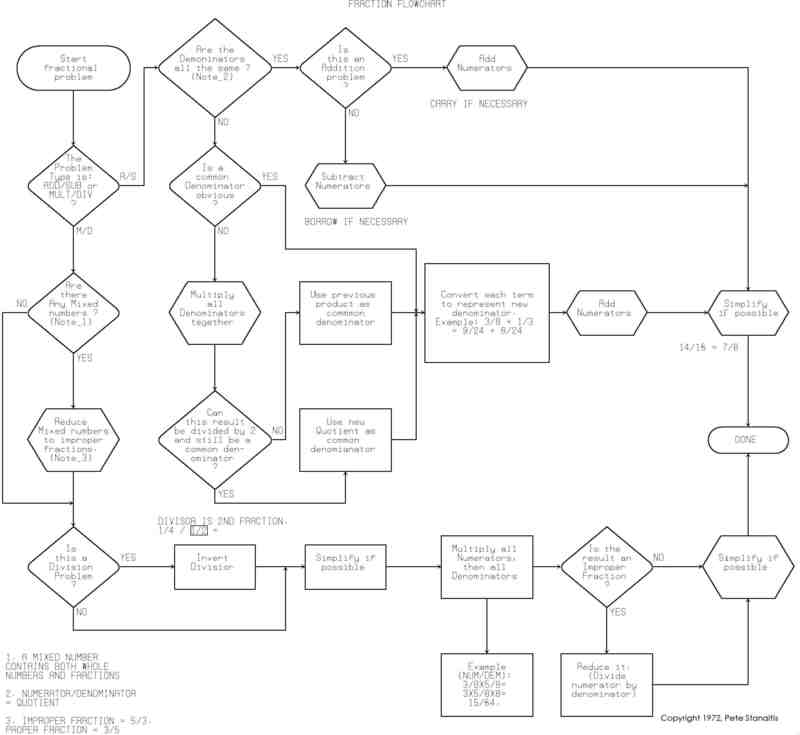 So, after we finally waded through the problem, I decided to build this flowchart. The idea is that this chart should cover the very basics of "Fractions" all on page. So, no matter how "lost" you might be, you can at least figure out where you are in the process and where to go next. I envision it as being of most use to parents like myself who have, many years ago committed the principles of fractions to rote memory and don't need to remember all the terms as in a school like setting. I don't guarantee this flowchart to be perfect in all ways, so if you see anything that would improve it, please let me know. It was put on Haventree's "Interactive Easyflow" (TM) software many years after its initial creation on paper in the early 1970's. The image on your screen will be very large, so you can see the information easily. To print it, right click on the image and save it. Then print it with your graphic program. If you need this chart badly and can't get it to print, email me and I'll see that you get a copy. To use this chart (which is often called a "flowchart"), you simply go to the the "Start" box. Read the text in the box and answer the question. Then follow the arrow that is appropriate for the answer you gave. Anwser the question in that box or do what it tells you to do. There are "notes" in a few places to help clarify certain things. You will always start in the upper left hand corner, the "Start" box and end in the middle of the right hand side at the "Done" box.